Billed as the first free walking tour in not only Buenos Aires, but in all of South America, the five-year-old BA Free Tour outfit offers regular guided tours, led by knowledgeable and enthusiastic BA locals (known as “porteños”), around both the city center (2.5 hours, Monday–Saturday 11am) and the Recoleta and Retiro nabes (2 hours; Monday–Saturday 5pm). The well-organized city center tours touch on the politics, history, architecture, and culture of Buenos Aires, with stops at iconic sites like Congreso, the Casa Rosada, and the Obelisk. While group size varies, our outing was comprised of some 15 tourists, a mix of visitors from around the globe. 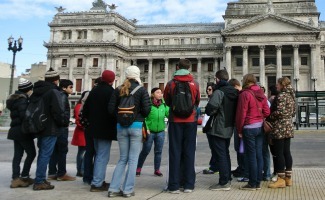 BA Free Tour also offers late-afternoon “Aristocratic” walking tours past the mansions of the upscale Recoleta and neighboring Retiro quarters, with stops at La Recoleta Cemetery and along the mansion-lined Avenida Alvear, while offering insights into porteño cultural and lifestyles en route. See lesser-known BA 'hoods with the passionate porteños behind El Otro Porteño, a new tour company. Two neighborhood tours are currently offered each week in the off-the-beaten path quarters of Belgrano and Caballito, for visitors looking to wander beyond guidebook terrain. We took their weekend Belgrano tour (3.5 hours; Sundays 1pm), led by the company's passionate founder, a lifelong Belgrano resident who infuses his commentary with personal anecdotes. Circuits document the fast-paced changes in this part of the city, which is home to historic plazas, churches, old houses, and leafy streets. Stick around for the optional tour extension at the end and hop a bus to a newish riverbank park that serves as a somber yet poignant memorial to the victims of the country’s brutal dictatorship. Our tour ended up being practically private with just three people, and ran two hours over, for added value. Another El Otro Porteño outing, on Mondays (3 hours; 9:15am), runs through the Caballito quarter, with stops at a historic market, an old-fashioned barber shop, and the church where Pope Francis was baptized. These thoroughly researched, two-hour weekend tours have been operated by a pair of porteño pals since 2011. Running through the posh Recoleta neighborhood (Friday by appt., Saturday–Sunday; 3:45pm), tour-goers will visit the historic Pilar Church and have a comprehensive look at La Recoleta Cemetery, with its massive mausoleums and notable interred residents (like Eva Perón). The guides offer fun facts and entertaining anecdotes, and come armed with a flip-book of related historical photos. They can even coordinate tours in three languages on request (English, Spanish, and Portuguese). Our tour was practically private, with just two attendees. Plus, as a nice finishing touch, the guides leave you with a brochure of some of their recommended tourism experiences throughout the city, plus a mini-guide of colloquial BA expressions. Two more tours to try: While I didn’t get out to personally try these additional options, two more free walking tours to consider include Buenos Aires Local Tours (4 hours; Monday–Saturday at 11am), which runs by foot, subway, and bus from Palermo, to the Abasto quarter (known for its tango heritage), La Plaza de Congreso, and Plaza de Mayo. Or, try Buenos Aires Free Walks (3 hours; daily at 10:30am), which runs tours from the bustling city center, near the esteemed Teatro Colón, to the exclusive Recoleta ‘hood.